It's super special and will be a great present! 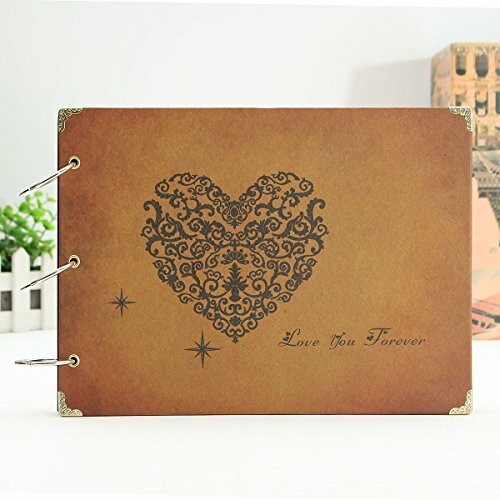 You can get a beautiful original design photo album with Memo Writing Area,record Family travel,Holiday,Friends, Wedding, Baby growth, Daily memory,Business celebration, Work photos,Picture,Sweet photos. Make a unique and unparalleled handmade gift by yourself the person you love, keeps those special memories in such a special album. Recording all your wonderful moments. This is more like a remembrance book than just a photo album. Each of creative memories pictures are detailed noted by sweet words, telling your thoughts and feelings. Love needs to be expressed. Year by year, the value of the album will be more and more precious. Maybe hundreds of years later it will be a special family heirloom. 【DIY Picture Album Size】: 27 x 19 x 1,5cm(10,6" x 7,5" x 0,6") inch.Best choice for wedding anniversary couples family friends graduation birthday travel record. 【Blank Paper】: No lines,you can draw mind maps,sketch ideas or write notes freely on the paper. Perfectly as a journal notebook,drawing pad,sketchbook,diary plan book,travel memory book. 【Refillable Photo Book】:The book is for assembly: back, front, black insides and the rings for binding. The inside is black cardboard and look high quality. 【Unique Gift】: Valentines day gift / Mother's day gift/Christmas gift /Birthday gift/ Personalized gift /Engagements/Graduations or any other festival gifts. 【Satisfaction Guarantee】: 12 months quality guarantee and 30 days refund guarantee. If you have any problems, please do not hesitate to contact us.Our customer are always here for you. If you have any questions about this product by MAMACHU, contact us by completing and submitting the form below. If you are looking for a specif part number, please include it with your message.